Tauhu Telor or Fluffy Eggs With Bean Curd is an Indonesian comfort food which is simple and yet so delicious! I always order it whenever I dine at an Indonesian restaurant back in Asia. Sadly, the restaurants here in Vancouver does not serve Tahu Telor in that method, so, I decided to try to replicate the dish at home, in a simplified method and presentation though. The bean curd is deep-fried using a special mold. I wish I have a picture to show you, but sorry I don’t. The end result, or shall I say, taste-wise, it turned out pretty good or maybe even a tad better than at the restaurant. Anyway, I love anything tofu as they are full protein and is so delicious. Tauhu telur is another great meat-less alternative to get your protein requirements! Spicy Peanut Sauce: Heat peanut oil over medium heat. Fry peanut until golden brown and drain well. Then fry chilies, shallots and garlic until soften and fragrant. Reserve the oil, for frying the tofu and eggs. Crush the peanut in a pestle and mortar or a food processor until you have a medium fine paste. Crush or pound fried shallots, garlic and chilies until you have a fine paste. Then mix in the peanut, adjust season with sea salt, palm sugar, kicap manis and adjust the sauce consistency with warm water. For the Tauhu Telur: Heat the reserved oil and add extra oil, if necessary. Fry the tofu until light golden in color. Drain the tofu on a paper towel,and divide into 2 portions. In a mixing bowl, crack 2 eggs, beat well and add chicken granules, sea salt, pepper, and scallions. Beat the egg mixtures until lightly frothy and mix in the fried tofu. Using the same pan and oil, over medium to high heat. When the oil is hot, add egg mixture. Fry until both sides are golden brown in colour. Remove and drain well. 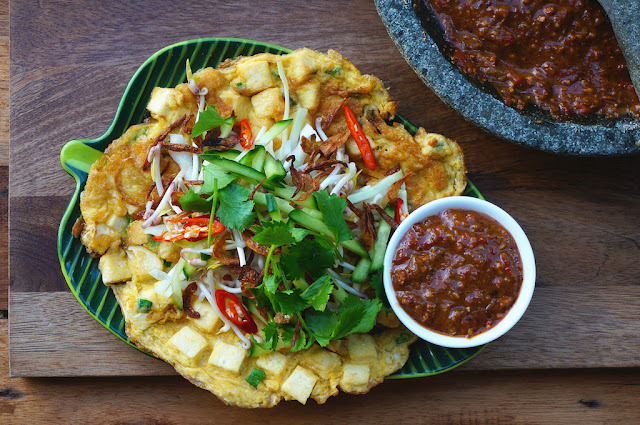 To serve, top the tauhu telur with some bean sprouts and cucumber. Serve immediately with the prepared spicy peanut sauce. I remember eating this tofu nest at an Indonesian restaurant back in KL. I like your way of cooking as I too don't have the mould to cook it in. I'm with Gert, I've tried the Tauhu Egg Nest too in KL, could be the same place actually but it was yum and yours look so much better, neat, clean and pure clarity! This is a good idea to topped with tofu for more protein goodness!